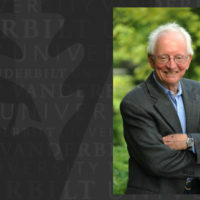 Mark Wallace, director of the Vanderbilt Brain Institute and a prolific and distinguished neurobiologist and mentor, has been named dean of the Vanderbilt University Graduate School, Provost and Vice Chancellor for Academic Affairs Susan Wente announced today. Wallace was selected for the role following a search that began in September 2015 and was conducted by a diverse, cross-college search committee chaired by Camilla Benbow, Patricia and Rodes Hart Dean of Education and Human Development. He assumed his new responsibilities Jan. 1. His formal appointment will be for five years and is pending approval by the Vanderbilt University Board of Trust. As dean of the Graduate School, Wallace serves as the chief administrator for all graduate programs within the university’s schools and colleges. The Graduate School is the pathway and official school of record for graduate student applications, admissions, registration and enrollment; the monitoring and recording of academic progress and milestones; and the awarding of degrees. In addition, Wallace will oversee graduate offices of diversity, professional development, placement and postdoctoral affairs. Wallace was a member of the Graduate Education Study Group, which Wente charged in September 2014 with laying the course for the future of graduate education. The executive summary of the study group’s draft recommendations was released in May 2015. Wente has already made several strategic investments based on the recommendations, which included designating new space for the school administration and activities and planning for expanded and enhanced career development resources and counseling services across the spectrum of disciplines. The investments also included separating the responsibilities of the vice provost for research from the dean of the graduate school to allow the dean to focus solely on excellence in graduate education. Wallace will work closely with the new vice provost for research, Padma Raghavan, who joins the university Feb. 1. In early 2016, the Graduate School will move to a new home in the recently renovated Alumni Hall designed to facilitate graduate student access. 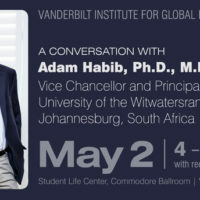 Since 2008, Wallace has led the Vanderbilt Brain Institute, which comprises nearly 500 faculty, students and staff representing five Vanderbilt colleges and schools, 22 departments, and 27 centers and institutes. One of the institute’s key responsibilities is administering the Neuroscience Graduate Program, one of the university’s largest Ph.D. programs and one of the nation’s leading programs in the pre-doctoral training of students interested in neuroscience. 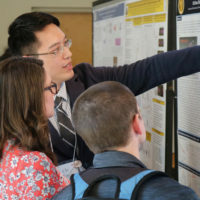 There are currently 81 graduate students and 64 training faculty in the program, which was named “Program of the Year” in 2012 by the Society for Neuroscience. As director, Wallace also oversees neuroscience research activities and community outreach and development activities. University leadership will be working with Wallace to transition his Vanderbilt Brain Institute responsibilities over the next six months. Wallace’s own research and that of his laboratory centers on better understanding how the brain synthesizes information from the different senses (e.g., vision, hearing, touch). He is the director of the university’s National Institutes of Health neuroscience training grant and a key leader in new interdisciplinary neuroscience efforts, including the educational neuroscience doctoral program, launched in 2012 as the first of its kind in the nation, and the Music, Mind and Society trans-institutional program. Wallace joined the Vanderbilt University School of Medicine in 2006 as associate professor in the Department of Hearing and Speech Sciences and as associate professor of psychology. In 2008, he was promoted to professor of hearing and speech sciences, psychology and psychiatry and also named director of the Brain Institute. He was named associate director of the Silvio O. Conte Center for Neuroscience Research in 2010 and was awarded the Louise B. McGavock Endowed Chair in 2015. He is an investigator at the Vanderbilt Kennedy Center for Research on Human Development and a member of the Center for Integrative and Cognitive Neuroscience. Wallace earned his bachelor of arts in biology in 1985 and his doctorate in neurobiology in 1990 from Temple University. From 1990 to 1993, he conducted postdoctoral research at Virginia Commonwealth University School of Medicine, where he was the recipient of a National Institute of Health National Research Service Award and subsequently served as assistant professor of physiology from 1993 to 1994. 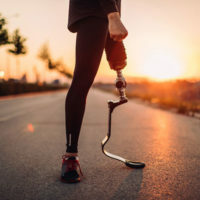 He joined Wake Forest University School of Medicine as assistant professor of neurobiology and anatomy in 1994 and was promoted to associate professor in 2002, a position he held until joining Vanderbilt. Wallace has mentored more than 50 doctoral and postdoctoral students and is the author of well over 100 publications in peer-reviewed journals and book chapters. His research program is supported by multiple NIH awards and several private foundations. 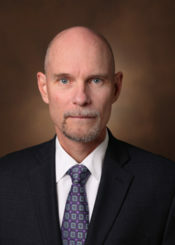 His professional awards and recognitions include being named a fellow of the European Brain Research Organization and an Outstanding Young Investigator in the Basic Sciences by Wake Forest University, both in 1997, and receiving the Faculty Excellence Award from Wake Forest in 2003 and the Frijda Chair in Cognitive Science from the University of Amsterdam in 2015. He is a member of multiple professional organizations, including the International Multisensory Research Forum, where he has served as an officer from 2001 to present; the American Association for the Advancement of Science; the Society for Neuroscience; the International Brain Research Organization; the American Physiological Society; the International Society for Psychophysics; the Middle Tennessee Chapter of the Society for Neuroscience, where he served as secretary and treasurer from 2008 to 2009; and the Western North Carolina Chapter of the Society for Neuroscience, where he served as president from 2003 to 2005. Wallace is married to Jeanne Wallace, Vanderbilt’s attending veterinarian and the director of the Division of Animal Care. Their daughter, Alicia Jayo, is currently attending Columbia Business School in New York City. Wallace succeeds Vice Provost for Academic and Strategic Affairs John Geer, who has served as interim dean of the Graduate School since Jan. 1, 2015.